With an aggressive stance that always says let’s hit the road, the 2014 Honda Crosstour has the look of a wagon and the handling of an agile car. An offshoot of the Honda Accord, the Crosstour provides classy looks, plenty of modern features, and lots of cargo space. While not an exact wagon per se, the Crosstour has the functionality and the brawn to go grille-to-grille with much of what the wagon class has to offer. This includes the 2014 Subaru Outback. Drivers looking at the Outback may want to take a closer look at the Crosstour. With more standard features and a similar starting price, it may be exactly what you’re looking for. We’re matching up the 2014 Crosstour EX and the 2014 Subaru Outback 2.5i CVT. Off the bat, both vehicles offer a similar power rating and fuel economy. The Crosstour starts off ahead with more power and better fuel economy. 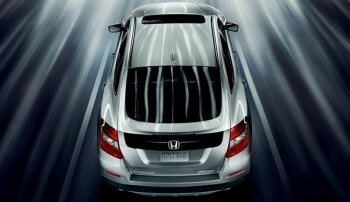 The standard 2014 Honda Crosstour’s engine produces 192 hp and gets and average highway fuel economy of 31 mpg. * That’s compared to the 173 hp / 30 mpg rating on the Outback. We like the Crosstour because it pushes boundaries in more ways than one. If you would like to take the Crosstour out around Middletown for a test drive, we encourage you to stop by our dealership. Middletown Honda is located at 520 Route 211, in Middletown, just a short drive from Mechanicstown and many other OrangeCounty area communities. If you have any questions about the Crosstour or financing, we encourage you contact our Honda sales team. * 22 city/31 highway mpg rating for 2WD 4-cylinder models. 20 city/30 highway mpg rating for 2WD V-6 models. 19 city/28 highway mpg rating for 4WD V-6 models. Based on 2014 EPA mileage ratings. Use for comparison purposes only. Your mileage will vary depending on how you drive and maintain your vehicle.